Fall in love with God. Christian women are constantly bombarded with pressures and struggles concerning love, intimacy, and their bodies from the world�s system. Temptations run rampant, and sometimes, it�s hard to hear God�s voice in the midst of the chatter from well-meaning girlfriends, boyfriends they have no business being with, and last but not least, their own desires. 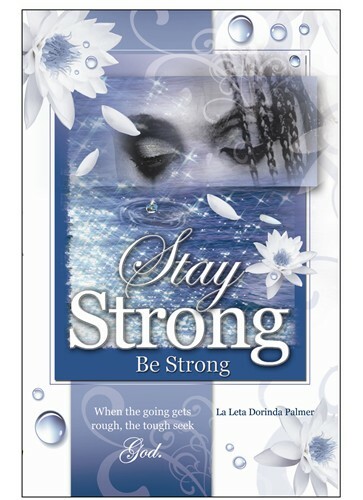 In Stay Strong, La Leta Dorinda Palmer comes clean and shares what she has experienced in Bio Notes as a Christian woman continuing to fulfi ll Jesus� purpose for her life. With the use of essays, short stories, poetry, Personal (Bible) Studies, and prose, she hopes to encourage readers (married, single, male, or female) to hide the Word of God in their hearts so they will not have the desire to sin against Him. Stay Strong gently reminds women to let patience have her perfect work so they will be whole, mature, and lack nothing. Through these God-inspired writings, Christian women can take to heart and truly understand the precious gifts they have to offer the man who can only come from God with His seal of approval...redeemed!